Learn everything about Margaux Bordeaux Wine in our complete guide, wine tasting notes, top 10 facts about Margaux wines and vineyards, wine and food pairing tips, a look at the character and style of all the best wines from the Margaux appellation, detailed profiles on the top wines and vineyards with histories of the properties, and wine buying tips. In this Margaux Bordeaux wine guide, you’ll discover the best Bordeaux wines from Margaux that marry power with elegance, silky tannins and sensuous textures. Flavors of ripe dark berries, truffle, tobacco, cassis and violets are the signature of the wines from this region located in the southern area of the Medoc. The best wines often have great purity of fruit with velvet like textures. The Bordeaux wines of Margaux, just like those from every wine region come in a variety of shapes, sizes, styles and prices. Generally speaking, the wines of Margaux are the epitome of elegance complicated by their unique floral characteristics. Overview of Margaux: It could be argued that prior to 2000, Margaux was a region known as much for its great terroir and reputation, as it was for the number of chateaux that were under performing based on their true potential to make great wine From the 2000 vintage on, that was no longer the case for the Margaux appellation. Improvements in the Left Bank vineyards and wine making techniques, coupled with the desire to produce the best wines possible from Margaux have sparked numerous chateaux to wake from their deep sleep. Consumers have not had so many high quality Margaux wines to chose from for more than 100 years! In fact, the wines of Margaux are so consistently good now, I think the appellation has never made wines of this level of quality in the history of the region! Chateau Rauzan Segla, Chateau Malescot St. Exupery, Chateau Brane Cantenac and Chateau Brane Cantenac are all producing the best wines in their history, as is Chateau d’Issan, Chateau Giscours and Chateau Marquis dAlesme. It’s not only the Classified growths of the region that are making better wine in the appellation, today, wines like Chateau Labegorce are also worthy of being noticed! The two best wines of the Margaux region remain Chateau Margaux and Chateau Palmer. While Chateau Palmer has not had a down period since the late 1990’s, following the 2000 vintage, and definitely after the 2004 vintage, Palmer has been remarkably consistent and continue making some of the best wines in their, distinguished history as well! That being said, there are other Classified Growths in Margaux that would be demoted or declassified, should another classification take place. Interestingly, the Margaux appellation is probably home to the widest array of obscure, 1855 Classified Growths. History of Margaux: The Margaux appellation was the first Bordeaux area cultivated for vineyards. There is evidence that the Romans planted grapes in the area almost 2,000 years ago. The famed Roman poet Ausonious poetically called the region Marojallia, which is where the winery known as Marojallia, found its name. Skipping ahead close to 1700 years, Margaux had already earned its well deserved reputation for producing great wine. That reputation caused Thomas Jefferson, the third President of the United States to visit different chateaux in the region, including Chateau Margaux. Margaux wine and food pairings: The wines of Margaux are easy to pair with a wide array of different foods and cooking techniques. One of the most natural wine and food combinations is Margaux with lamb. Of course Margaux pairs equally well with almost any grilled, braised or roasted meat ranging from beef, veal, pork, duck, pigeon, squab and game. Margaux wines are perfect with roasted chicken, mushrooms, truffles or other earthy dishes. Fish works well with the wines of Margaux, depending on how the fish was prepared and sauced. Margaux and cheese is also a natural wine and food pairing. The taste, character and style of Margaux wine: Due to its massive size and diverse array of soils, the wines of Margaux are quite varied. While not the most concentrated, powerful or tannic wines of Bordeaux, they can be the most elegant, sensuous, refined and perfumed. With scents of flowers, especially violets and lilacs, the wines also offer when mature; scents of truffle, cigar box, earth, cherry, plum and tobacco. While the levels of concentration, ripeness and depth vary widely, depending on the terroir and desire of the winemaker, the tannins can display unmatched levels of elegance. However, don’t let that the softness fool you into thinking the wines do not age well. The best Margaux wines can age gracefully for several decades. #1 Margaux is the warmest, major appellation in the Left Bank, thus it is almost always the first to harvest. 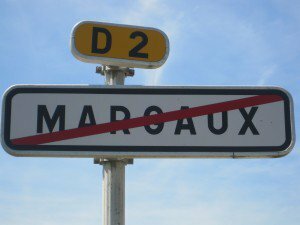 #2 Margaux is considered to be the first appellation planted for vines by the ancient Romans. #3 The Margaux appellation has the largest concentration chateaux classified in 1855 with 21 classed growths in total. #4 Margaux is the only major appellation with a chateau named after the region, Chateau Margaux. #5 Cabernet Sauvignon is the main grape in Margaux, followed by Merlot, Cabernet Franc, Petit Verdot, Malbec and Carmenere. #6 Margaux wines are among the most floral in all of Bordeaux. Tasters often find aromas of violets in wines from the Margaux appellation. #7 The Margaux appellation is the home of 5, Second Growth chateaux, more than any other appellation. #8 Margaux with 1,355 hectares under vine is the second largest, major appellation in the Medoc. #9 Margaux has the most diverse array of terroir and soil types in Bordeaux ranging from large deposits of gravel, limestone with pebbles, stones and rocks to clay. #10 Margaux is the home of the smallest vineyard in the 1855 Classification. Chateau Ferriere is only 8 hectares. The Classification of Margaux: With 1,355 hectares under vine, the appellation is just slightly smaller than St. Estephe, making it the second largest, major appellation in the Medoc. Today, close to 80 different chateaux maintain vineyards in the appellation. In total, close to 600,000 cases of wine are produced in the Margaux appellation each year. The Margaux appellation is famous for a multitude of reasons. Maybe it is has something to do with knowing a total of 21 chateaux were included in the original 1855 classification. That is more than any other Bordeaux appellation. While Chateau Margaux deservedly rules the appellation as it is a wine of true, First growth quality, the Margaux region is rich in 1855 Classified Growths. The commune features: 1 First Growth, 5 Second Growths, 10 Third Growths, 4 Fourth Growths, 2 Fifth Growths and an array of good quality, Cru Bourgeois chateaux. 20 Cru Bourgeois classified growths come from the Margaux appellation. There are a few of those estates that in any serious reclassification could be classed as a Fifth Growth today. Perhaps Chateau Labegorce is the leading estate in this category today. 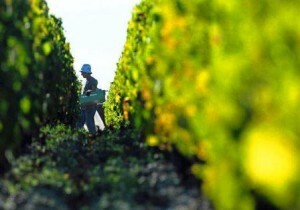 In total, slightly more than 80 producers make wine in the Margaux appellation. The Margaux appellation is the only Bordeaux region, where the most famous chateau is named after the appellation; Chateau Margaux. The sight of perhaps the most famous estate in all of Bordeaux and its stunning portico reminds every wine lover of the Bordeaux wine region. Thomas Jefferson, the third President of the United States liked the elegant, refined wines of Chateau Margaux so much, that during his visit to the famous chateau, Thomas Jefferson ordered several cases of the 1784! The Left Bank appellation is the home to 5 unique communes; Margaux, Soussans, Arsac, Labarde and Cantenac. The best vintages of Margaux wines are: 2018, 2017, 2016, 2015, 2010, 2009, 2008, 2006, 2005, 2005, 2000, 1999, 1996, 1995, 1990, 1983, 1961, 1959, 1953, 1945, 1934, 1929, 1928 and 1900. Fans of the wines from Margaux should be thrilled as 2015 is the first vintage in ages where Margaux produced stunning wines from top to bottom! However, vintage charts for Margaux are more complicated to look at than it is with other appellations. For example, in most of the older vintages, you had very few estates making great wine. In fact, in some of those years, you might only find one estate that made a great wine, which makes buying wine from 1961 or 1990, two years which should be great, fraught with potential disaster for buyers that do not know which chateau made the great wine. 1982 and 1983 are two other interesting vintages for the Margaux appellation. In 1982, truthfully, only Chateau Margaux produced a world class wine. In 1983, it was entirely different as several estates made very good wines, much better on the whole than the rest of Bordeaux did. Earlier vintages were not consistent. Today, that is not the case as the majority of chateau in Margaux are making truly stunning wines! The terroir and soil of Margaux: The terroir of Margaux is perhaps the most diverse of any of the major Bordeaux appellations due to its size. Because of its size, the terroir naturally varies from chateau to chateau. Like every appellation, the best wines are most often made from the best terroir, which in Margaux, is the terroir with the deep gravel deposits on the elevations and hillsides. The elevations in Margaux range from 1 meter up to 30 meters, with the highest point in the appellation found at Chateau Angludet. Chateau Margaux has the best part of its vines planted in deep gravel soils. In the Margaux appellation, the terroir features soils with large deposits of gravel, limestone with pebbles, stones, rocks, white gravel and only a minor amount of clay in the vineyards. The preponderance of gravel and lack of clay affords Margaux with some of the poorest soils in Bordeaux, making it perfect for cultivating grapes. The gravel is paramount to helping determine the quality of the wines in Margaux. The gravel helps to provide natural drainage, reflect sunlight, retain heat and force the vines to dig deep into the soils. Of course there are exceptions to every rule and some estates do have more clay content in their terroir than others in the Margaux appellation. Those chateaux with heavier clay deposits plant more Merlot in their vineyards. Because the soils in the Margaux region are often thin and cannot easily hold water, the vines are forced to dig deep into the soil for nourishment. The comparative lack of depth in the soils of Margaux allows the soils to heat up faster. In turn, this transfer of heat from the soils to the vines help the grapes mature before the other Bordeaux appellations in the Medoc. The comparative lack of depth in part of the Margaux appellation, coupled with its geographical location as the most southern region in the Left Bank, makes it the warmest area in the Medoc. This has the effect of making Margaux the first appellation in the Left Bank to be picked most of the time. Those thin soils are also why most of the estates in the Margaux appellation do not do so well in the very dry, drought, heat struck vintages. That is because the soils do not always maintain the ability to retain as much water as the vines need. On the other hand, that specific terroir is what gives Margaux wines their elegance and intense, beautiful, floral character, which is often compared to violets. The grapes of Margaux: The main grapes planted in the Margaux region are Cabernet Sauvignon and Merlot. While some Cabernet Franc, Petit Verdot, Malbec and even Carmenere are planted here as well, they are not the stars of the show. Dry white Bordeaux wines are also made by some Margaux chateau owners. The white wines are a blend of Sauvignon Blanc and Semillon. 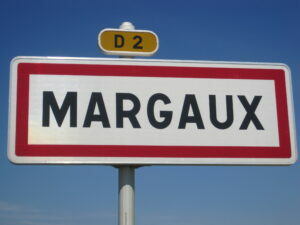 The grapes are grown outside the Margaux appellation which means the wines are not allowed to be sold as from Margaux. The wines are sold as generic AOC Bordeaux Blanc wines. While all the best red wines from Margaux are blends, Chateau Moutte Blanc, a tiny estate makes a wine from 100% Merlot. In large part, the combination of the percentages of grape varieties cultivated and the terroir, are what determines The difference between the wines of the Left Bank and those from the Right Bank. AOC Law and Rules for the Margaux appellation. What does it take to be a wine from Margaux? According to the decree of November 14, 1936, the wines of Margaux must meet precise production conditions: grape varieties, minimum sugar content, alcoholic strength 10.5% and limited yields. All vineyards must be located within the boundaries of the Margaux appellation, which include the following 5 communes; Margaux, Soussans, Arsac, Labarde and Cantenac. The wines are subject to a blind tasting. It’s also important to note that every quality produce in the region makes wine well above the minimum standard set by AOC law. Interestingly, a few estates in the Margaux appellation produce a small amount of white Bordeaux wine. While not common, white Bordeaux wine has been produced in the appellation for well over 100 years. 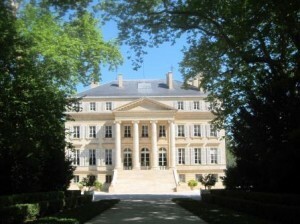 Chateau Margaux is the most famous of those producers making white wine. Pavillon Blanc, the white wine of Chateau Margaux is made from 100% Sauvignon Blanc. Other estates, for example, Prieure Lichine and Cantenac Brown also blend in small amounts of Semillon and others might add Muscadelle. Chateau Palmer produces very small amounts of white wine from completely different grape varietals. White Bordeaux wine from Margaux is sold as a generic Bordeaux. However, Chateau du Tertre produces a unique blend from white grapes that are not allowed in the appellation, which is sold as a Vin de France.